The former medical campus is being developed into a 142-unit apartment building. EDGEWATER — After months of delays and a partial demolition that came too early, developers behind the transformation of the former Edgewater Medical Center said plans are finally falling into place regarding remediation and wrecking of the site. 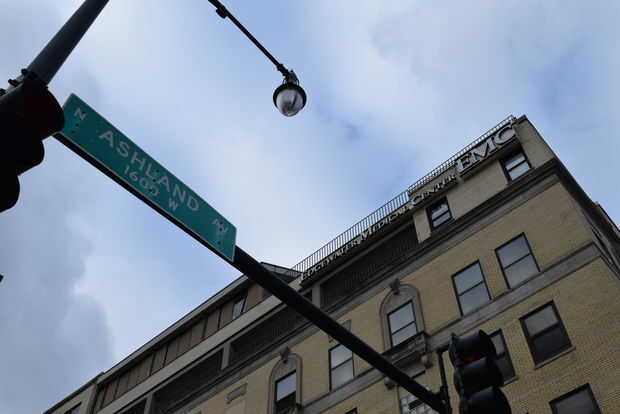 The medical campus at 5700 N. Ashland Ave. is slated to become 141 apartments, 78 parking spaces, single family homes and a park operated by the Chicago Park District. Ald. 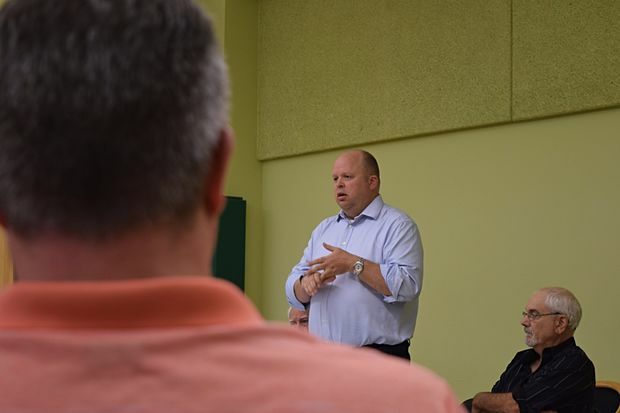 Patrick O'Connor (40th) held a community meeting Thursday night with Todd Mullen of MCZ Developments and two environmental remediation contractors working with him after work had noticeably stopped at the old hospital, fueling concern among neighbors. The reason for the stoppage was because Mullen's team had started demolition too soon, Mullen said. Though asbestos has been removed from the property, the park district required further environmental remediation of items like electrical switches and thermostats — some of which had already become part of a rubble heap when contractors began tearing down buildings in February. Environmental experts said Thursday the issue was more about hauling off wreckage to the landfill than a situation that posed a threat to the community. Before debris can be taken to a landfill, it must be cleared of certain items. "We kind of wanted get something done ... we came to a point where we were a little bit ahead of ourselves. We created a problem," Mullen said. Now, contractors with EPS Environmental and Alessio and Sons will be coming back to the site to hand-sift through the rubble for electrical pieces, as well as identify areas in the remaining buildings where the pieces may also be. Once remediation is finished, the park district has asked the property also undergo another round of radiation testing. O'Connor said the buildings were previously rid of most radiation many years ago when it was still in federal bankruptcy court. However, the park district agreed to take over the future park space only if it were inspected to its standards, he said. "The park district has standards that are higher than what a normal developer would have to deal with," explained Chenin Kienzler, an attorney and aide to O'Connor. Mullen also said he could relate to the irritation and worry felt by neighbors in recent months, and described the hospital project as "the most frustrating building I've ever" worked on. From "lakes of water" spilling from awnings into the buildings, to rotting scaffolding and repeated break-ins from curious explorers and photographers — the project has been "expensive," he said. Among a new expense Mullen said he would consider Thursday night is the hiring of an additional 24-hour security guard, at the request of residents. The property does have one guard on-site at all times. However with large portions of buildings exposed and multiple large structures, Mullen said he has felt like he has been "fighting a losing battle" when it comes to fending off unwanted visitors. "I started doing this stuff ... right out of college and I've never had a building where people go in as a lark, as fun, a thing to take pride in, to take pictures of," Mullen said. "I don't get it, I don't understand it. But they do it, and they're still doing it." However, officials also said there is also reason to feel hope and apologized for the setbacks. Remediation should finish up in the next eight weeks, followed by a roughly four-month demolition, Mullen said. It will take about another year to finish the apartment buildings and parking. In the meantime, Mullen and environmental engineers said the electrical materials that remain are not potentially dangerous to neighbors unless handled or ingested. Residents who attended the meeting asked for more transparency from developers and the city going forward, and demanded some access to official reports regarding the remediation and demolition process to ensure all work was done properly, such as creating a website. Mullen and O'Connor's office said they would work with neighbors on making more information accessible. "From MCZ's standpoint, we really just want to build the buildings," Mullen said. "We do feel that this is a great project, a great location. We're looking forward to just getting to that point where we can get back to doing what we do best."